The spacious interior fits all standard motherboards for your gaming needs. The brushed front panel gives the case an elegant look. Upon receipt of your order you will be asked to sign for the goods received in good condition. Matte front panel for an elegant look. Supports high-end VGAs up to 355mm/14.0” long and a CPU cooler up to 155mm / 6.1” tall. SD card reader x 1. In this case, the Supplier will inform you of any delay as soon as possible and will give you the option of cancelling your order at this point. Elite 342 (RC-342) is a mini-tower that accommodates micro-ATX, built with a modern black design body and front panel. This chassis maintains Elite's pedigree of compact-sized and quality build that would look great in any space. Customize and adjust your case via swappable aesthetics, adjustable layouts and intuitive thermal performance. Improved layout flexibility handles larger components and cooling systems within a discreet form factor. The MasterBox E300L combines practicality with an accent of style. Able to support high-end graphics cards (363mm), Micro-ATX, and Mini-ITX motherboards, the E300L also has generous room for easy assembly. The front panel keeps ventilation subtle while the side panel offers additional cooling support. Stand out from the rest with a Silver colour accent. With a compact and sensible design, the E300L is a cost effective chassis for your computing needs. Special Features • Brushed Front Panel: The brushed texture of the front panel adds an elegant element to your workstation or office. • Coloured Trim: Stand out from the rest with a nice Silver colour accent. • Security Lock Anchor: Security lock protects your system by positioning the anchor directly onto the chassis. One of the most compact, yet fully featured chassis for high performance M-ITX computing. Included is a large mesh front panel that offers reserved styling while allowing extreme airflow. It’s designed to fit in the most minute available desk space while supporting high performance hardware. Elite 130 supports: the largest VGAs from NVIDIA or AMD, 5 x HDDs and/or SSDs, a full-sized power supply, and even a thick 120mm DIY or AIO watercooling radiator. Special Features • Unprecedented airflow for a Mini-ITX case with front mesh panel and vents on the top and side panels • Dual Super Speed USB 3.0 • Supports a 120mm radiator in the front • Supports standard length ATX PSU • Supports ultra high-end graphics card up to 343mm / 13. Sleek and Elegant Design The brushed front panel gives the case an elegant look. Show off your build in style through the edge to edge transparent acrylic side panel and let your system stand out with an all-black background and PSU cover. Expanding The Possibilities for All Your Components The spacious interior fits all standard motherboards for your gaming needs. Black coating and an included PSU cover that allows for easy, simple configurations for your gaming build. Let your configuration stand out with an all-black background. Special Features • Sleek and Elegant Outlook Design: The stylish brushed front panel gives the chassis a sleek and elegant design. • Colour Plan of Side Trims: Choose from three different colours to suit your style: Red, Blue and Gunmetal. Format: ATX, Mini ITX. Komputery zamknięte w obudowie Mini-ITX nie muszą mieć w środku słabych części, o czym doskonale świadczy płyta główna Asus Maximus VI Impact czy też karta graficzna Asus Geforce GTX 670 DirectCU Mini. Cooler Master Obudowa MasterBox Lite 3 (USB 3.0)MCW-L3S2-KN5N / KOCLMOE00000015. Złącza na przednim panelu: 1 x mikrofon, 2 x USB 3.0. Liczba miejsc montażowych: 3. Miejsca montażowe 2,5" wewn. : 1. Wentylator: 12 cm. Obudowa Mini Tower kompatybilna z płytami głównymi typu Micro ATX i Mini ITX, wyposażona w 1 wnękę zewnętrzną 5.25 cala, 1 wnękę zewnętrzną 3.5 cala, 2 wnęki wewnętrzne 3.5 cala, 4 x 2.5 cala oraz 4 sloty rozszerzeń. 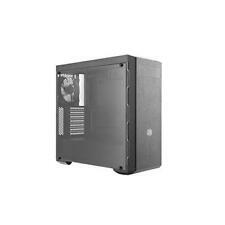 Cooler Master Obudowa MasterBox MB600LMCB-B600L-KA5N-S02 / KOCLMOD00000054. Liczba miejsc montażowych: 4. Miejsca montażowe 2,5" wewn. : 1. Wentylator: 12 cm. Okres gwarancji (miesiące): 24. Typ gwarancji: gwarancja normalna. 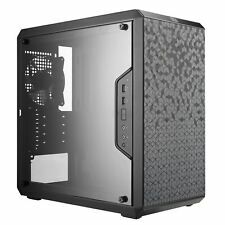 Cooler Master MasterCase Pro 3 Mini Tower Case - Black. COMPACT MASTERCASE WITH EXTERNAL AND INTERNAL MODULARITY. Customize and adjust your case via swappable aesthetics, adjustable layouts and intuitive thermal performance. Cooler Master Obudowa ELITE 344 USB 3.0RC-344-SKN2 / KOCLMOD0E000004. Złącza na przednim panelu: 1 x USB 3.0, 1 x mikrofon, 1 x słuchawki, 2 x USB 2.0. Okres gwarancji (miesiące): 24. Typ gwarancji: gwarancja normalna. The 1st microATX case with noise cancelling foam lined front door and side panels from Cooler Master. Dual Super Speed USB 3.0 & SD card reader. Product Details & Features. Item model number: SIL-352M-KKN1. A series that might be small in size but excels in functionality and modularity without compromising on the thermal performance. The I/O panel can be adjusted to six different locations, three options at each side of the case. MasterBox Q300P. - RGB LED Fans: Two pre-installed 120mm RGB LED fans behind the front panel and RGB lighting at the top front can create an amazing lighting effect. - 1-to-3 Splitter Cable for RGB LED Fans: The RGB Connector Splitter and 4 pin male to male adapters are included. The 1st microATX case with noise cancelling foam lined front door and side panels from Cooler Master. - Dual Super Speed USB 3.0 & SD card reader. Card reader integrated Yes. Maximum CPU cooler height 15.5 cm. The front supports a single 80mm, 90mm and 120mm fan. The MasterBox E300L case supports CPU-Coolers up to a height of 148mm, Graphic Cards up to a length of 363mm and Power Supplies up to a length of 180mm. 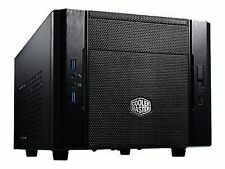 Cooler Master SILENCIO 352 USB3.0 Mini-ITX/Micro-ATX Mini SILENT TOWER CASE MATTE BLACK WITH SD CARD READER - SIL-352M-KKN1 (Components > Computer Cases). - The 1st microATX case with noise cancelling foam lined front door and side panels from Cooler Master. SIL-352M-KKN1 COOLER MASTER SILENCIO 352 USB3.0 Mini-ITX/Micro-ATX Mini SILENT TOWER CASE MATTE BLACK WITH SD CARD READER - SIL-352M-KKN1 (Components > Computer Cases). - The 1st microATX case with noise cancelling foam lined front door and side panels from Cooler Master. Cooler Master Silencio 452 to obudowa typu midi-tower o dużych możliwościach rozbudowy. Posiada aż 6 zatok HDD oraz 2 SSD, filtry przeciwkurzowe, wsparcie dla chłodzenia wodnego, czy też maty tłumiące będące znakiem rozpoznawczym serii Silencio. Cooler Master Obudowa Cooler Master Mastercase Pro 3 MCY-C3P1-KWNN (kolor czarny)MCY-C3P1-KWNN / OBUCOLAXM0021. Cooler Master Case MasterBox Q300P Computer Case - MCB-Q300P-KANN-S02 (Components > Computer Cases) }. A series that might be small in size but excels in functionality and modularity without compromising on the thermal performance. Dual Super Speed USB 3.0 & SD card reader. Maximum CPU cooler height 15.5 cm. Card reader integrated Yes. Side window No. Colour of product Black. Number of 5.25" bays 4. Number of 3.5" bays 3. Number of 2.5" bays 4. A series that might be small in size but excels in functionality and modularity without compromising on the thermal performance. Manufacturer: Cooler Master. - 1 to 3 Splitter Cable for RGB LED Fans: The RGB Connector Splitter and 4 pin male to male adapters are included. 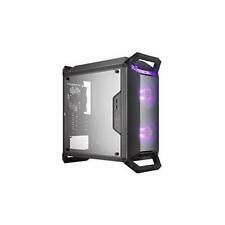 Buy Cooler Master MasterBox Q300P Mini Tower Case featuring Micro-ATX and Mini-ITX, 1 x 3.5, Drive Bay 2 x 2.5, Drive Bays. Review Cooler Master MasterBox Q300P. CPU Cooler Height 6.18" / 157 mm. 4-Pin Male to Male Adapters. Manufacturer: Coolermaster. N200 System Cabinet Computer Case Mini Tower. The N200 not only supports 120mm radiators at the back, but is the first mini tower that supports installing 120mm or even 240mm radiators in the front of the case! MasterBox Q300P Computer Case Chassis. Product Line: MasterBox. Manufacturer: Coolermaster. Product Family: MasterBox. Four removable handles make it easy to transport or carry your full system build to a LAN Party. 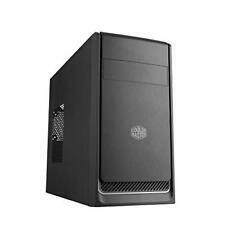 Cooler Master MasterBox Q300P Black Mini Tower Case (M-ITX/M-ATX) . The I/O panel can be adjusted to six different locations, three options at each side of the case. Two RGB fans are pre- installed in the front of the case. Box Contains Cooler Master Q300P MasterBox Computer Case - Black. Cooler Master MasterBox Lite 3 Computer Case 'microATX, Mini-ITX, USB 3.0, ... .
With this Micro–ATX case, we've added a few ways to give you more room to work with.This model is our compact high airflow (up to 2 front fans and one rear fan) black painted rear / interior Mini–ITX / Micro–ATX case. Cooler Master MasterBox Lite 5 RGB Computer Case 'ATX, Micro-ATX, Mini-ITX, Includes 3 x 120mm RGB Fans, Tempered Glass Side Panel' MCW-L5S3-KGNN-02. Cooler Master MasterBox Lite 5 RGB MCWL5S3KGNN02 Components Computer Cases. Silencio 452. Cooler Master SILENCIO 452 ATX CASE USB3.0 SD CARD READER. ATX, microATX. Dual Super Speed USB 3.0 &SD card reader. USB 3.0 x 2, USB 2.0 x 1, SD card reader (Class 10) x 1, Audio x 1, Mic x 1, Front I/O. 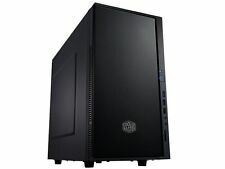 Cooler Master Silencio 452 Computer Case 'ATX, microATX, USB 3.0, Solid Side Panel' SIL-452-KKN1. Silencio 452. Cooler Master SILENCIO 452 ATX CASE USB3.0 SD CARD READER. ATX, microATX. USB 3.0 x 2, USB 2.0 x 1, SD card reader (Class 10) x 1, Audio x 1, Mic x 1, Front I/O.